When search in Google, you can always see people are asking questions, like "Can delete pictures on Instagram be recovered on iPhone? ", "how to recover a deleted Instagram pictures with the likes", and "can you undelete pictures from Instagram", etc. If you really happen have deleted Instagram photos and videos on iPhone, you can get them back with the following mentioned Instagram photo recovery iPhone ways. First, it’s necessary to explain the theory of how to find deleted photos on iPhone. By default, there are 2 main ways: scan iPhone for the deleted Instagram photos and recover deleted Instagram photos on iPhone with one of the previous backup file, either iTunes or iCloud backup file. Why it works while scanning the iPhone to restore deleted Instagram photos? All files stored on devices occupy the space. When a file is deleted, it doesn’t disappear right away, but invisible, waiting to be replaced by new data. In this case, once you find you’ve deleted Instagram photos on iPhone, you should scan your iPhone right away, avoiding losing them permanently. 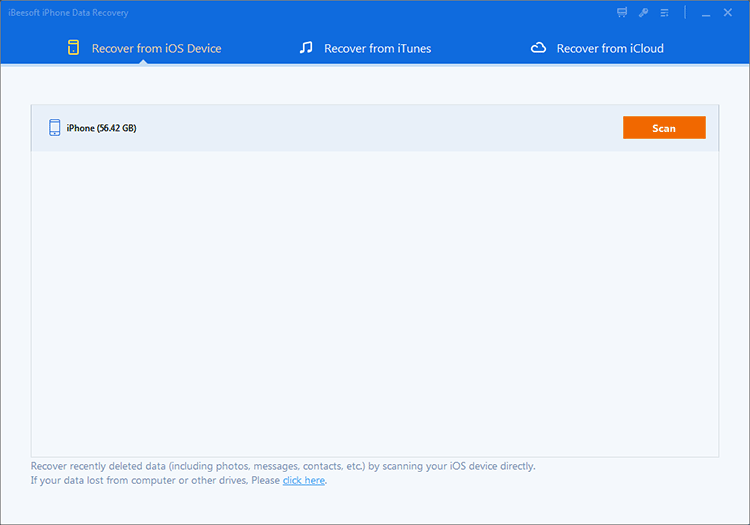 And Apple has developed iTunes and iCloud to back up all files on iPhone, in case of data loss. In this case, you can try the restore way as well. However, it also means the backup file will replace all current data. Let’s see how to recover Instagram photos and videos on iPhone with the workable ways. If you try this method, you need to install iBeesoft iPhone Data Recovery first. It will scan your iPhone, looking for the deleted Instagram photos and videos. You can’t do it by yourself because the deleted files are invisible. It likes the magnet used to looking for metal in the sand. It will scan all deleted data on your iPhone, sorting the found files, let you preview and recover the ones you need. Download the iPhone data recovery software to recover permanently deleted photos from iPhone now! Download and install the latest version of the iPhone Instagram photos/videos recovery software. It’s fully compatible with Windows 10, Windows 7, Windows 8 and the other Windows operating system. It’s virus free and feels free to install it. 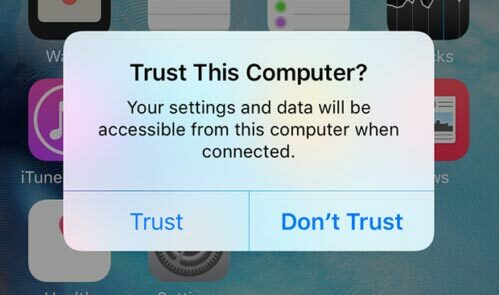 After then, use a digital cable to connect your iPhone with your computer, making sure you’ve tapped the "trust the computer" on your iPhone. By doing this, you can see your computer will detect your iPhone successfully. Launch the software and you can see your iPhone is displayed there. Click "Recover from iOS" from the main window, and the software will scan your iPhone for the deleted Instagram photos. It might take a few minutes. It depends on how many files found on your iPhone. When it finished the scanning process, you can see all found files are sorted into categories, making it easy for you to filter out the files you need. After then, you can select files to preview before recovering them. When finding the deleted Instagram photos and videos on iPhone, click "Recover" to save them on your computer. As I have mentioned, you can restore deleted Instagram photos and videos to iPhone with an iCloud Backup file. Actually, there are 2 options: extract an iCloud backup file to get deleted Instagram photos and restore the whole iCloud backup file to your iPhone. The second option will erase the current data with the backup file. Please choose the right one according to your situation. 2. From the iCloud backup list, please pick the one that you’ve backed up before you delete Instagram photos and videos and click "Scan". 3. It takes a few seconds for the software to extract all files from the big package. After then, you can select Instagram photos, saving them to your computer again. 1. Tap on Settings > General > Reset on your iPhone, then tap "Erase All Content and Settings." It’s the first step if you want to restore deleted Instagram photos with the former backup file. 2. After then, please tap Restore from iCloud Backup, then sign in to iCloud. 3. 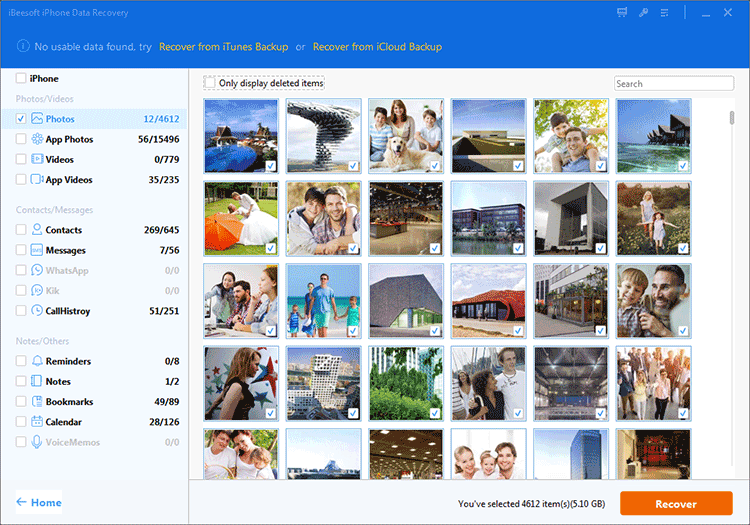 Choose the right iCloud backup file which contains the deleted Instagram photos and videos. It will take a long time for the whole process. Please be patient. If you have backed up your iPhone to iTunes before deleting the Instagram photos and videos, you can restore them. Step 1. Download and install the latest iBeesoft data recovery software. After then, you can see it in the main window. Please click "Recover from iTunes". Step 2. From the iTunes backup list, select the iTunes backup which you’ve made before you deleting the Instagram photos or videos. After then, click "Scan". Step 3. In the result window, please filter out the videos and photos categories. Select the files you need and save them to your computer. Step 1. Install the latest iTunes version on your computer. After then connect your iPhone with your computer, making sure your iPhone appears on your iTunes. Step 2.Select Restore Backup in iTunes. 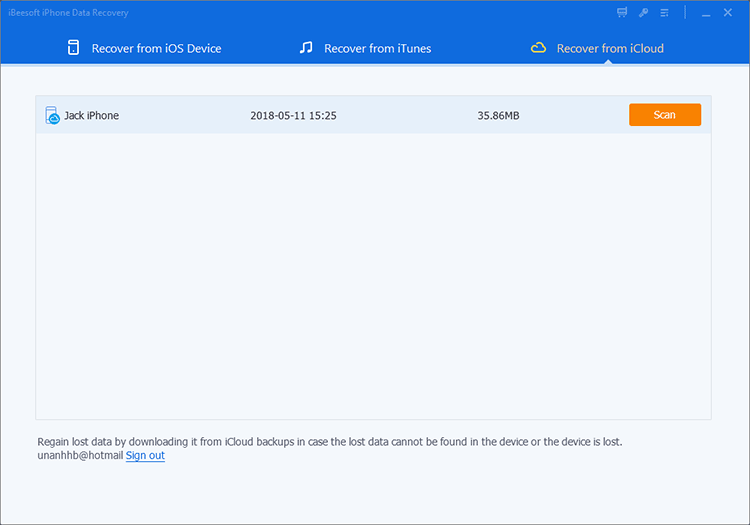 Select the right iTunes backup file and click Restore. It will take a while for the files restored to your iPhone. Please keep in mind, all the current files will be erased by the iTunes backup file.